It was under his reign that the mayor of the palace began to play the most important role in the political life of Austrasia. That mayor, Grimoald, the son of Pepin I, managed to convince the king to adopt his son Childebert. When Sigebert finally had a son of his own, the future Dagobert II, the mayor of the palace felt threatened, and on the death of Sigebert (at the age of 25) he exiled the young Dagobert to Ireland. Sigebert's remains, defiled during the French Revolution, are preserved in the cathedral at Nancy. Austrasien var ett frankiskt kungarike under merovingerna, från 500-talet till 700-talet. Det omfattande områden på båda sidor av mellersta Rhen, med huvudorterna Metz och Reims. Sigisbert wurde schon als Kind mit drei Jahren 633/34 von seinem Vater Dagobert I. auf den Thron von Austrasien erhoben. Nach dem Tode des Vaters 639 unternahmen die für ihn Regiernden, mehrere - fehlgeschlagene - Versuche zur Erringung der Macht im gesamten Frankenreich. Nachdem er alt genug war, selbst die Regierung zu führen, herrschte weithin Friede. Er erwies sich der Kirche gegenüber als wohltätig; sein Eintreten zugunsten von Remaclus führten zur Gründung von Klöstern in den Ardennen, zunächst in Cugnon, dann in Stablo - das heutige Stavelot - und Malmedy; weitere Klöster und viele Kirchen und Spitäler gehen auf seine Unterstützung zurück. Dagobert II. wurde sein Nachfolger. Sigebert III (c. 630–656/660) was the king of Austrasia from 634 to his death probably on 1 February 656, or maybe as late as 660. He was the eldest son of Dagobert I. To satisfy the Austrasian aristocracy, who exercised a certain autonomy, Sigebert's father gave him the kingdom of Austrasia although it remained part of the larger Frankish realm. On the death of Dagobert, Sigebert ruled Austrasia independently, and free from any subjection to Neustria. 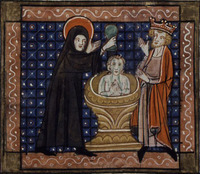 Under the tutelage of Blessed Pepin of Landen and other saints of the time, the young king grew into pious adulthood. He tried in vain to add Thuringia to his kingdom, but was defeated by Duke Radulph in 640. Though only ten years of age, he was the leader of his army. The Chronicle of Fredegar records that the rout left him weeping in his saddle. From this, we can surmise that, at least in part, the downfall of the Merovingian dynasty was a result of child rule, for both Sigebert and his younger brother Clovis II, who ruled in Neustria, were prepubescent children who could not fight on the field and whose regents had their own interests at heart. Though not a success as a king, he was revered as the founder of numerous monasteries, hospitals, and churches. He is regarded as a saint by the Roman Catholic Church and is the patron saint of Nancy. He has been described as the first roi fainéant—do-nothing king—of the Merovingian dynasty. When King Sigebert III died in 656, Grimoald the Elder had Sigebert's son Dagobert II shorn of hair and packed off to an Irish monastery and then proclaimed his own son, Childebert the Adopted (or Adoptivus), king of Austrasia. http://en.wikipedia.org/wiki/Sigebert_III -------------------- It was under his reign that the mayor of the palace began to play the most important role in the political life of Austrasia. That mayor, Grimoald, the son of Pepin I, managed to convince the king to adopt his son Childebert. When Sigebert finally had a son of his own, the future Dagobert II, the mayor of the palace felt threatened, and on the death of Sigebert (at the age of 25) he exiled the young Dagobert to Ireland. Sigebert's remains, defiled during the French Revolution, are preserved in the cathedral at Nancy. Thus, Pepin le Vieux or de Landen truly reigns as the Major Domo] to 656. He reigned under the tutellage of Pepin of Landen [when Pepin de Landen died in 640, Otto succeeded him] and of Grimoald. In 641, the nobles of Austrasia have Otto assassinated and Grimolad, son of Pepin becames Mayor of the Palace, and the Francs lose their sovereignty over Thuringia. Siegbert (el III apodado el santo Rey de Austrasia Para satisfacer las exigencias de autonomía de la aristocracia local, su padre le cede en el año 632 el reino de Austrasia y se instala en Metz en el año 634, pero sigue estando bajo la tutela del rey franco hasta la muerte de Dagoberto en el año 639. En ese año, Sigeberto recibe como herencia Austrasia, aunque ahora liberada de toda dependencia de Neustria. Intenta inútilmente someter a Radulfo, duque de Turingia, que le vence en el año 640. Durante su reinado es cuando el mayordomo de palacio empieza a tener un papel importante en la vida política de Austrasia. Dejó el gobierno en manos del mayordomo Grimoaldo, que era hijo de Pipino de Landen que lo convence para que adopte a su propio hijo, al que bautizó como Childeberto, un nombre de rey merovingio. Posteriormente Sigeberto tuvo un hijo, el futuro Dagoberto II, pero el mayordomo se siente amenazado y a la muerte del rey, lo obliga a ingresar en una comunidad monástica y lo exilia a Irlanda.